According to Ofcom in October 2013, superfast broadband is now available to almost three quarters of UK homes. If fibre broadband is available in your area, it is important that you make the right choice of ISP and fibre broadband service to make the most of this new technology. Many ISPs offer fibre broadband services. Typically, minimum contract lengths range from 12 to 18 months so please consider your choice with care. Given that fibre broadband prices change almost daily and that services are offered by a great many ISPs, we have focused (below) on popular options or options where we have had particularly good experience. It is important to consider your expected usage of fibre services. Some fibre services offered by ISPs limit monthly usage overall, or at peak time, and these are generally cheaper. For example, BT's cheapest fibre service has a monthly allowance of 40 GB. While restricted usage may suit certain users, unlimited packages eliminate the concerns of exceeding a monthly allowance so that you are free to get the most from a fibre broadband connection. online backup services, such as Carbonite, Livedrive and Apple iCloud. These could be accessible by a range of devices in the home, including mobile phones, notebooks, tablets and Sky+ boxes. So, even if your current broadband usage is relatively modest, you may find that usage increases substantially with fibre as you take advantage of the wide, and increasing, range of services on offer. Recently, Ofcom reported that the average usage of superfast connections (55 GB in June 2013) is almost double that of conventional broadband connections. Look out for any "fair usage" limits that may apply with ISPs claiming to offer unlimited usage options. "Fair usage" restrictions can be monthly allowances in a different guise! As with conventional broadband, there is a great deal of confusion about speeds delivered by fibre broadband services. 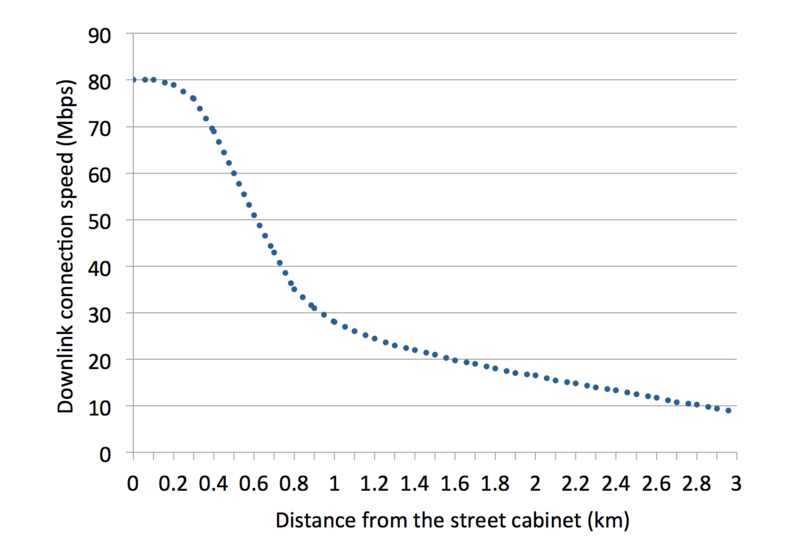 Just as the data rates of conventional broadband fall as the distance from the exchange increases (as explained in our Chart of ADSL and ADSL2+ speed versus distance article), so the speeds of fibre broadband fall as the distance from the fibre street cabinet increases. The chart below shows the expected downlink connection speed of fibre broadband (BT’s FTTC service) for different distances from the fibre street cabinet. Only those living relatively close to the fibre street cabinet would be able to benefit from packages with the greatest maximum speeds. So, there may be little point in opting for one of the fastest packages, and this approach could save you money! Furthermore, all of the applications that have been discussed above (including streaming of HD TV content) can be successfully delivered with downlink speeds significantly less than 40 Mbps. lack of traffic management (at peak times). In an ideal world, you would rarely need to contact customer services. However, if you need help with a fault, a service upgrade/downgrade or a billing or technical query, you may want your issue addressed quickly and effectively. As discussed below, smaller ISPs can often provide superior, UK-based, customer support compared with larger ISPs. It is worthwhile looking for feedback from existing customers before taking the plunge and ISPReview provides a useful list of UK broadband ISPs ranked in terms of real customer ratings. Bundling of services (to include TV services) is becoming more prevalent, and companies such as Sky, TalkTalk and BT are increasingly incentivising users with a bundled range of services. For example, BT Broadband customers can now get access to BT Sport channels for free. If you are an existing Sky TV or TalkTalk TV customer, we recommend that you identify any special offers. Speeds can be affected by traffic management in broadband networks, whereby speeds are throttled back at busy times to avoid congestion. Some ISPs (e.g. Plusnet) clearly state that traffic can be "managed" during busy periods with some services de-prioritised. Other ISPs, including BT Broadband, Zen Internet and Xilo, clearly state that they do not implement any type of traffic management. So which fibre ISP should I opt for? As you have probably guessed from the discussion above, there is not a single answer for everyone, so you will have to make the decision based on what is important to you. To help further, we will now consider a number of popular ISP options, from the largest to the smallest. BT Broadband is the biggest broadband ISP in the UK with about 7 million customers and a substantial market share of fibre connections. Fibre broadband customers receive 'free' access to the new BT Sports channels on multiple devices (via fibre broadband and Sky boxes), and some sports enthusiasts may be swayed by the recent announcement that BT has secured the rights to screen Champions League matches. We have been critical of BT's telephone customer support and BT currently relies on overseas call centres. However, customers can often get a much better response online using the BT Customer Support Community Forum. For the latest information about current BT prices and offers, visit the BT Broadband website. Sky offers a range of bundled broadband, telephone and TV services. We recommend existing Sky customers to contact Sky to understand the latest offers, as these are often unpublished and are dependent on whether you subscribe to other Sky services. Sky is currently focusing on its 'up to 38 Mbps' fibre service, with a significant price difference between its 'up to 38 Mbps' and 'up to 76 Mbps' services. For the latest Sky fibre broadband prices and offers, visit the Sky Broadband site. TalkTalk is one of the UK's largest ISP, with a reputation for offering low-priced telephone, broadband (and more recently) TV services. Customers can expect to pay a premium of about £10 per month for TalkTalk's unlimited 'up to 38 Mbps' fibre service over its conventional unlimited broadband service. TalkTalk has received criticism in the past for the quality of its customer support. However, we have found that TalkTalk users can often get a better response online using the TalkTalk Community. For the latest prices and offers, visit the TalkTalk site. We have found that smaller ISPs can offer superior support to customers compared with the largest ISPs, although they are generally not able to match the broadest bundles of services offered by the largest ISPs (particularly involving TV). We have had very positive experiences with Xilo (rated as the number one ISP in the UK from customer feedback by ISPReview). Zen Internet is also a well regarded ISP offering fibre broadband services and is recommended by the Which Guide. Some small ISPs tend to focus on offering fibre broadband service with monthly usage allowances, which may be restrictive compared with unlimited packages. However, we advise speaking to ISPs as some unlimited fibre services on offer are not advertised on their websites. For example, we understand that Xilo offers an affordable unlimited fibre option for users in certain areas of the country. While the comparison between fibre broadband and conventional fibre services is complicated by special offers and promotions, you can currently expect to pay around £10 per month to upgrade from conventional broadband to high-speed fibre broadband. Given that fibre broadband generally provides a much superior experience to conventional broadband, many users may feel that this price premium is worth paying. For those users who cannot justify the increased cost, we recommend viewing our Increase Broadband Speed Guide, to get the highest speeds for your existing broadband connection. Thanks to Alastair Brydon of Unwired Insight for providing an analysis of the latest state of play with fibre broadband services.